Orthopedic tools - tools and equipment used in operations and a number of non-operative interventions in orthopaedic and trauma patients. Part of orthopedic instruments is pure trauma instruments used in operations mainly only in trauma patients. Depending on the destination orthopedic instruments are divided into: 1) orthopedic instruments, intended for operations, and 2) orthopedic tools for non-surgical interventions (overlay skeletal traction, applying and removing plaster bandages etc). At carrying out of orthopedic and traumatologic operations, excluding special, needed and General surgical instruments (see Surgical instruments). Sterilization of metal orthopedic instruments is made by boiling or by autoclaving (see Sterilization surgery). Keep tools in a clean, dry in special cabinets. Hinges castles moving parts orthopedic instruments should be greased with vaseline oil. Tools with sharp cutting surface can be stored in alcohol or dezinficiruyusch solution, they must be periodically to sharpen. 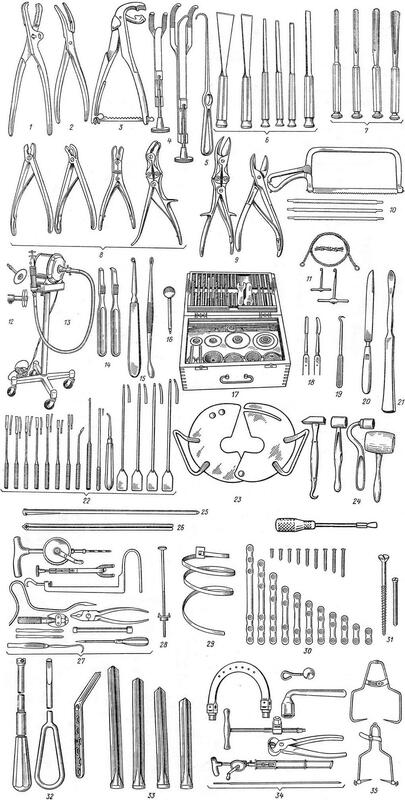 Orthopedic instruments, intended for surgical interventions, includes tools and toolboxes for operations on the bones, tendons, muscles and other soft tissues, as well as special sets for individual types of orthopedic and trauma surgery (for example, set for intramedullary osteosynthesis hips and others). Depending on the purpose and principle of operation orthopedic tools can be divided into several groups. Holding tools - pliers and costumerectal. To hold the bone fragments use bone forceps (Fig. 1), for grasping shards of bone and sequestrum - sekvestranty (Fig. 2). For fixation of bone fragments in the wound and hold them when osteosynthesis (see) are different costumerectal: Lamotta (Fig. 3), screw Treasury (Fig. 4) and other Costumerectal make split, which enables to make each branch separately under bone and to build the tool in the wound. Depending on the diameter of the bone, fracture features of the operating wounds , and the operation is applied costumerectal various sizes, straight or bent at an angle. To derive a bone fragment in the wound is stupid odnowy bone hook (Fig. 5). For operations on bone dissection and chiselling, biting, sawing, drilling and so on - are the tools with sharp edges. For chiselling and bone dissection apply chisels flat (Fig. 6) and globularia (Fig. 7). Flat chisels can be unilateral or bilateral sharpening. For biting bone ribs, refreshment edges bones used pliers-tongs: Luara - with globulinami sponges (Fig. 8) and Liston - with direct sponges (Fig. 9). These pliers can be straight, curved on the plane, curved on edge, and articulated with dual transfer. For sawing bones are the saw frame, or arc, and wire saw Gigli. To arc saw (Fig. 10) follow typically 4 cutting of fabric - wide, 2 medium and narrow. Gigli saw (Fig. 11) consists of twisted wire saws and two pens. This saw is used for sawing of a bone in hard to reach places. Under bone special guide you down a saw, then loops on the ends insert the handle. For sawing of a bone graft are circular saws - double with a fixed distance between them and single (Fig. 12). They are driven by an electric drive (Fig. 13). For the Department of periosteum from the bones are raspatory straight and curved (Fig. 14). Scraping cavities in the bones produce sharp bone spoons (Fig. 15) various sizes. For drilling holes, holes, TV in the bones, the formation of joint surfaces when arthroplasty apply mills (Fig. 16) and drills of various dimensions. There are special sets of milling cutters and drills (Fig. 17). For treatment of acute ends of the bones use rasps with a large notch. Tools for operations on the tendons, muscles and other soft tissues includes: tenotomy (Fig. 18), tendon hooks (Fig. 19), amputation knife (Fig. 20). For plastic operations on the tendons of the hand and fingers is a set of tools Rozov (Fig. 22), which includes the tendon raspatory, tenotomy, transferline Shyla, conductor, "goat leg" to ofseparate tendons, Buji. When working tools with sharp sharpening to protect the soft tissues from damage to the elevators are used (Fig. 21) and retractors (Fig. 23). 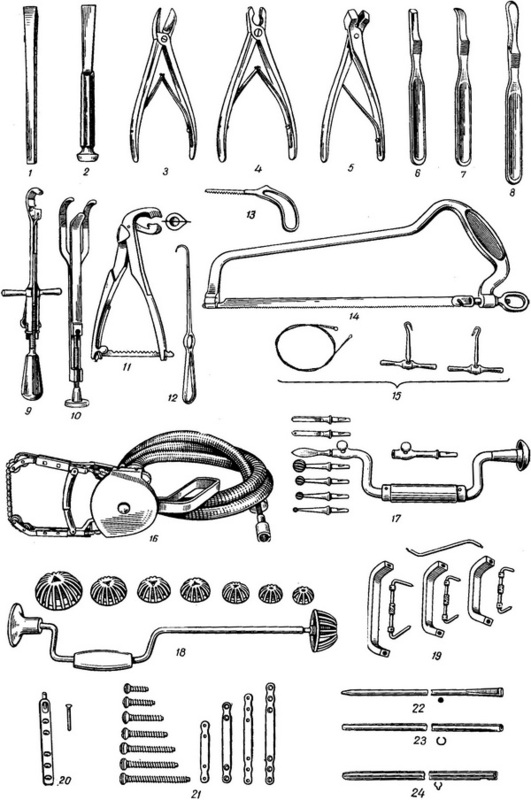 Part of orthopedic instruments must include various hammers (Fig. 24), necessary for working with bits, for hammering nails at osteosynthesis. For fastening of fragments of bones are various tabs. Intraosseous fixation of fractures of long tubular bones are made with metal rods design Dubrova (Fig. 25), Kundera (Fig. 26), the Central Institute of traumatology and others Set for intraosseous commit (Fig. 27) includes rods of varying length and diameter, drill and drill bits, fixing hook to extract stem, triangular drill, hand tisocki, small bits odnopolie hooks, pliers, nozzle, Shilo, impactor and extractor. For osteosynthesis used with bolts and nuts (Fig. 28), cerclage tape (Fig. 29), of plate plate (Fig. 30), the screws (Fig. 31). Slots of screws and bolts should be deep enough and meet the screwdriver (Fig. 32). For osteosynthesis of fractures of the femoral neck are various designs are three nails (Fig. 33), for the introduction of which use special devices (Petrov - ASNOVA, Kaplan and others). Set orthopedic instruments for skeletal traction with needles (Fig. 34) consists of the brackets, pins, key, nativities spokes, latch needles, cutters, drills and retainer. For skeletal traction also use the terminals (Fig. 35). Set orthopedic tools for applying and removing plaster bandages - see Plaster technique. A significant part of orthopedic instruments are the tools proposed for operations on the joints and bones when they are fresh injury. This so-called trauma tools. 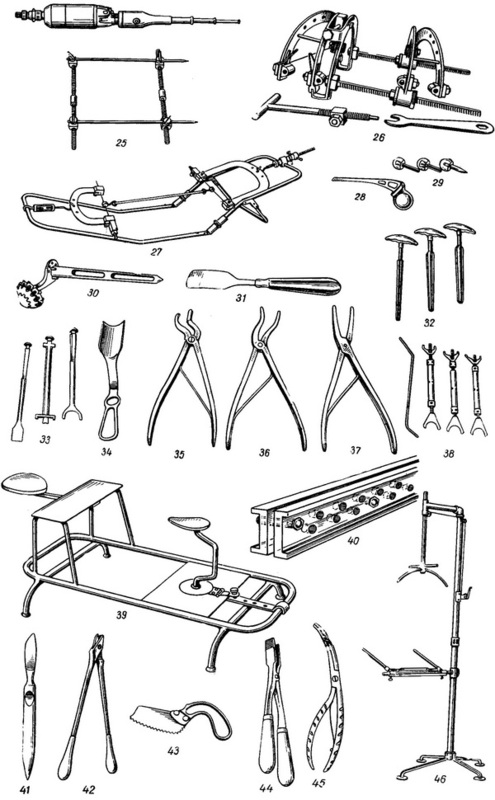 Modern orthopedic tools can be divided into: 1) common tools for orthopedic operations; 2) special tools for osteosynthesis, alloplasty, for operations on the spine and others; 3) tools for bloodless interventions. To common tools include chisels, cutters, raspatory, hooks, lifts, saws, milling machines, devices for mechanical processing of bones. The bits of Bergmann blades pass directly to the handle (Fig. 1). Bit of Machuine have octahedral a pen and extended platform for shock (Fig. 2). Set cyto consists of bits of different sizes (Fig. 55): 6 bits with bilateral sharpening, 6 bits-chisels with unilateral sharpening, 9 galabovci and 2 of the trapezoid form. There are different types of pliers: with direct sponges (Fig. 3), round (Fig. 4) and rectangular (Fig. 5). For the detachment of the soft tissue from the bone apply raspatory: direct (Fig. 6), bent (Fig. 7) and oval (Fig. 8). To keep bones during operations use kostadinite: dvojlozkova (Fig. 9), trekharkovy (Fig. 10) and type Lamotta (Fig. 11). It is often useful to retain fragments of bones odnosum hook (Fig. 12). Saws for bones apply the following types: a framework (Fig. 14) and knife (Fig. 13), and for figure dissection bones - wire saw Gigli (Fig. 15) and nepreryvnaya electric saw Sivash (Fig. 16). For drilling bones are cutters with rotation (Fig. 17) and b (Fig. 18), driven by an electric motor. Special tools are designed for osteosynthesis (see). To plate connectors refer plates lane (Fig. 21), records of HJK Helsinki, figured plates, plates with the Allen screw (Fig. 20), the plate with slot for convergence and fixation of fragments of bones, plate-hooks and apparatus for stitching fragments of bones titanium straps, as well as bringing closer the bracket design Gerzmava (Fig. 19). 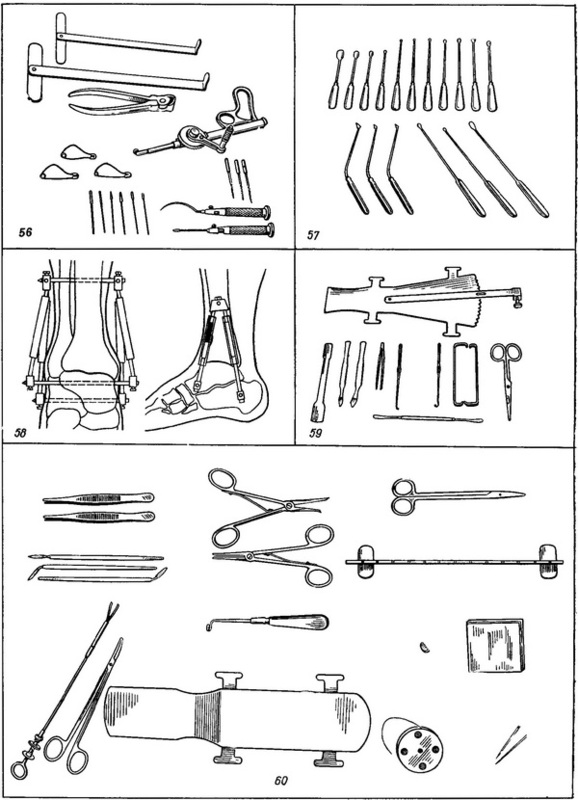 Intraosseous the clips used in the form of nails different designs: Kundera (Fig. 24), Dubrova (Fig. 22), cyto (Fig. 23). To the external connectors are different screws, bolts with nuts and sets the so-called compression devices: the device of the Sivash (Fig. 25), based on rapid convergence of fragments of bones by means of two "worms" with special nuts with rotating finger and two cobalt nails; apparatus Gudushauri (Fig. 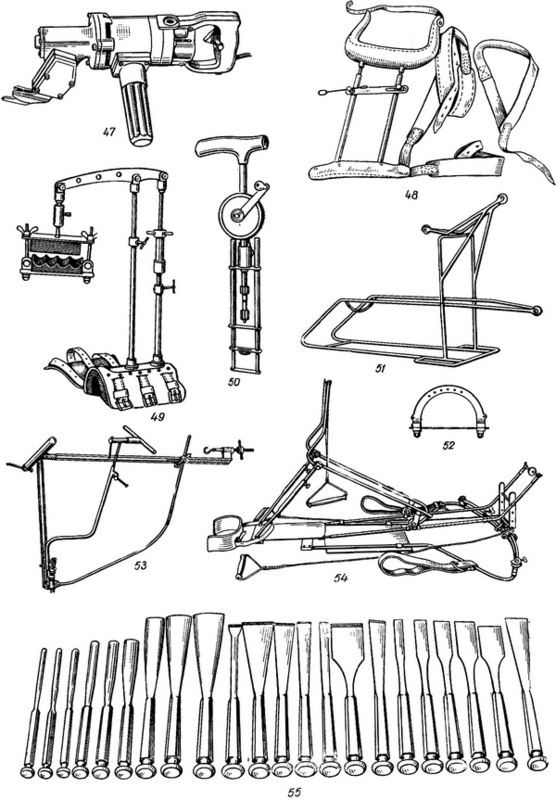 26), consisting of two pairs Poladov and two pairs of V-shape located spokes; the Ilizarov with X-figuratively located spokes; the device Grishina (Fig. 58), consisting of two pairs of clamping devices and three nails. On the same principle constructed office of Ashkenazi for bones ray-carpal joint (Fig. 27). Known methods of Greifensteiner that allows you to bring together the fragments of bones with the help of two spokes Kirchner pulled one arc. out of use due to frequent poor long-term results. Currently using metallic hip joint Sivash (Fig. 30) and a number of tools for its application, scan medullar channel hips (figure 32) tap wrenches to dive prostheses (Fig. 33), nepravitel (Fig. 34). A special group of orthopedic instruments are tools for operations on the spine. Respetar vertebral (Fig. 31) is wide, a certain radius and angle sharpening tool. Cutters fenestrated (Fig. 35) allow for easy cutting such on the one hand arch spinous processes, if need be limited hemilaminectomy. Cutters with a double bend over the edge and on the plane (Fig. 36) give the opportunity to work on the vertebral bodies through a small hole made by costtrandate. Cutters beaked (Fig. 37) allow you to manipulate on the intervertebral discs and in the depth of the medullar channel. Set of table (Fig. 57) provides treatment of bone cavities in the depth of the wound at the front and rear access. Distractor Kazmina (Fig. 38) allows you to correct curvature of the spine in operations on the occasion of scoliosis. Metal plates Williams designed for rear fixation of the spine, but for this purpose more convenient thermoplastic the latch of the Sivash (Fig. 40), particularly in patients with pronounced kyphosis and lordosis. This latch can be shaped in any form, if you put it in 1-2 minutes in hot water. Tools for surgery on hand and fingers are produced sets: the set Degtyareva (Fig. 60), set Kuster (Fig. 56), a set of Hamara (Fig. 59). The tools in these sets differ not only in size and shape, but, more importantly, by the peculiarities of the working part. Tools for bloodless treatment of orthopedic patients divided into three groups: for applying and removing plaster bandages, for the treatment of skeletal extension and various bus for immobilization and functional treatment of fractures of bones. The imposition of plaster bandages produce pillow-tables (see Operating tables), pelvic stand Krasnobaeva (Fig. 39) and on the machine for applying plaster corsets (Fig. 46). For removal of plaster bandages using a special knife (Fig. 41), shear (Fig. 42), saw (Fig. 43), tongs for cultivation edges (Fig. 44), tongs, bending edges (Fig. 45) and electrohippies (Fig. 47). Skeletal traction (see) produced with the assistance of the spokes and the arc Kirchner (Fig. 52), shall be attached to drill for needles (Fig. 50). Tyres most often used: bus Kuzminsky fracture of the clavicle (Fig. 48), bus Ivanova for treatment of fractures of the forearm (Fig. 49), bus Aleinikov for treatment of fractures of the shoulder and forearm (Fig. 53), the bus by Capitol records for the treatment of bone fractures of the femur and tibia (Fig. 51), the bus Sivash - Sdvizhkova (Fig. 54) to restore the function in the hip and knee joint at treatment of fractures of the femur and tibia.